We sat down with Venus to talk about who she is and why she bloomed where she was planted. I like to say that I bloomed where I was planted. I was born in Aransas Pass Texas, via a Corpus Christi hospital, and I currently live one block away from the house I grew up in. I love being a part of the Aransas Pass and also Port Aransas community. I started at the University in 1984, as a secretary with then Associate Director, Mr. John Thompson. Twice I quit and took a sabbatical for my two children. I was hired back both times and feel very fortunate for that. When I came back to work after my first leave, I worked in shipping and receiving under Lynn Amos. After my second leave I came back right when the Fisheries and Mariculture Laboratory (FAML) had an opening and have been at FAML ever since. In my current position, I handle travel scheduling and reimbursements for the Institute. I also take care of the people working at FAML, which includes notarizing forms and handling administrative work here. The scientist at FAML are always on the go and I try to make sure they get information as soon as possible, be it packages or messages so that they can continue on with their work, which is very important. For the travel aspect, I reimburse people for travel expenses and give guidance in their travel needs or reservations. I also try to help when people are stranded or in a travel jam. I’ve truly been blessed to work with a lot of good people. Each FAML director has been very considerate of me and my job. Thanks Connie, Joan and Lee. The appreciation is a really nice thing to have and I don’t take it for granted. Thanks also to my super-supervisors I have been fortunate to have been placed with – JoAnn Page, Kathy Quade, Lynn Amos and Patty Webb. Extra note on Patty - very generous to all her people. When something is going on she helps them work it out and I believe that makes for a better employee. The appreciation I get from people getting their money. It always strikes me as amusing, because it is my job, but sometimes they act like it is me personally giving them their money. I feel that if it was my money needing to be reimbursed I would want it as quick as possible. Oh the people - the people are great and are just so interesting and diverse. Every single one of them. I’ve also gotten to travel through people here. So when I get to genuinely travel I know the different places to go and who to contact! What is the most interesting or surprising thing you’ve gotten to do at UTMSI? It was so much fun when Connie Arnold was here and the first Cobia spawned. We had a picture of a baby carriage that said “It’s a spawn” and we put up these baby carriage pictures all over the building like it was a delivery. Everyone was so excited. It felt like we were all one – we had this wonderful result from research that they had been working on for so long and so hard. I work because I have to work and that is just reality - but what a joy to want to come to work! It’s always a pleasure to come and see what my coworkers are doing in their lives personally and professionally. When I get on the ferry every day, I think people pay to come over here and I get paid to be here. I’d be a Blenny Fish, specifically, the Roughhead Blenny. They are very small and cute. I was introduced to them one year through Cammie Hyatt (Buskey lab). The Blenny spends most of their life in worm holes and only come out for brief periods of time to feed. You stay home and only go out to eat? Who would not want to be a Blenny? 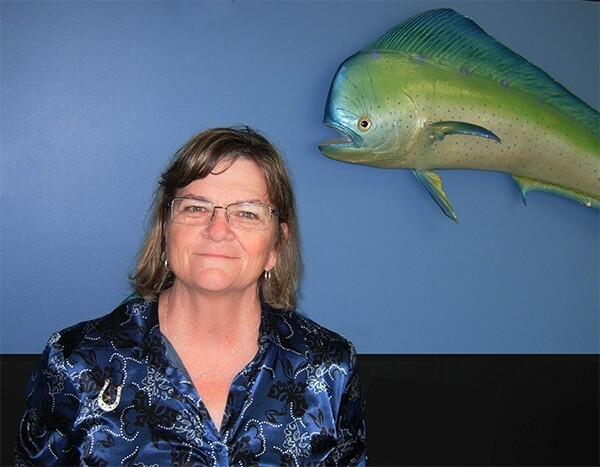 Venus Mills is the Administrative Associate for the Fisheries and Mariculture Laboratory at The University of Texas Marine Science Institute. She’s been working at the University since 1984 and was born in Aransas Pass, Texas (via a Corpus Christi hospital). Last year, Venus was surprised to receive one of the 2014 UT Austin Outstanding Service Awards, pictured with Director Dr. Bob Dickey. Credit: The University of Texas Marine Science Institute. Venus has worked at UTMSI for almost 30 years, including the time when The Lazarette Gazette was still in press. This image was drawn when she was working in the fiscal office handling the shipping and receiving. Picture left to right: Lynn Amos, Erin Meuth, Faye Smith, Venus Mills, Vicki Roberson, and Sandy Birdwell.